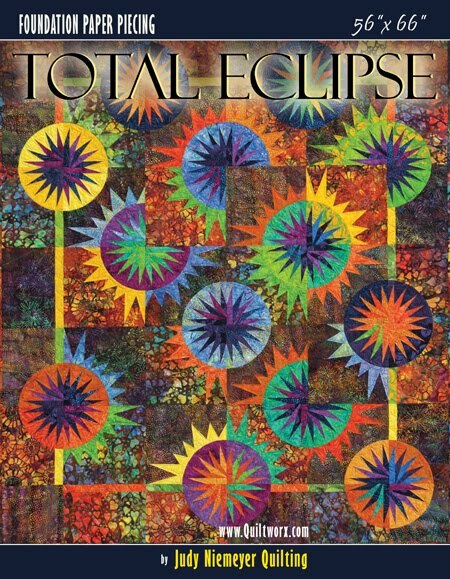 This is a paper pieced pattern from Judy Niemeyer called Total Eclipse. I chose bright batiks for my quilt. There are two units that basically comprise this quilt. Tons of quarter circle spike units. Loving them. Love the stack of them!! Aren't the bright batiks just fabulous? Here you can see I decided to play with the units and color options. At this point it is only play because I need to finish four more of the larger units before I can place them on the design wall and get the layout that I want. Another possibility. Even though there are only two units, they all look so different to me and each and everyone of them are just beautiful in their own way. I am excited to see them go up on the design wall. Next week, I will be taking a class with Judy but I won't have it complete in time. At least I don't think so, we'll see. This is the pattern and you can find it here. I don't think I will be naming mine Total Eclipse, I think mine will be Bubblegum and Lollipops. What do you think? Don't forget to enter the Kona Cotton Giveaway here. It is the last day!